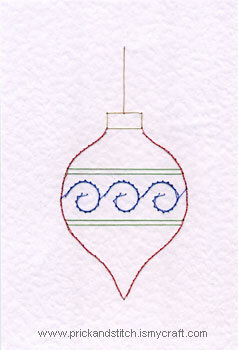 This Christmas bauble pattern is easy to stitch as most of the work comprises of stem stitch. The downloadable pattern includes instructions for stem stitch. The photograph shows the bauble outline stitched in metallic red thread. The swirls are blue and the lines are green. The bauble top and string are stitched in gold thread. Newsletters are sent out automatically each time I publish a new article on this web site. The newsletter service is managed by Feedburner. It may be that you accidentally unsubscribed. If your newsletters are still not arriving I suggest that you re-subscribe with the link in the right-hand column.